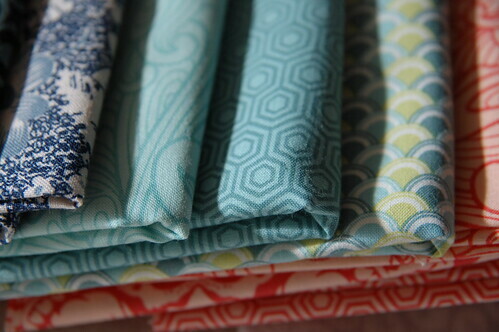 After a lot of hemming and hawing, I’ve finally decided on my colours and fabrics for my Double Wedding Ring quilt. The class is finally starting this Thursday! Originally, I was thinking red, blue and cream. This palette has been refined to coral, aqua, navy and creams with multi-colours. 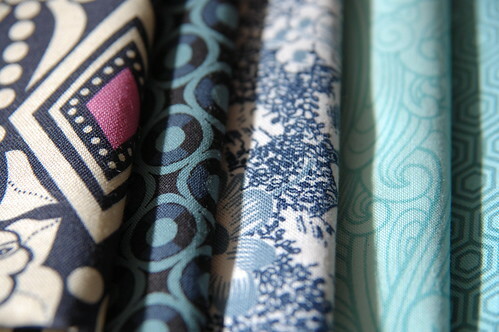 The inspiration basically came from all the new fabrics that came last week. The new Tula Pink ‘Neptune’ collection and Anna Maria Horner ‘Good Folk’ collection are so pretty that I can’t resist including them in this quilt. 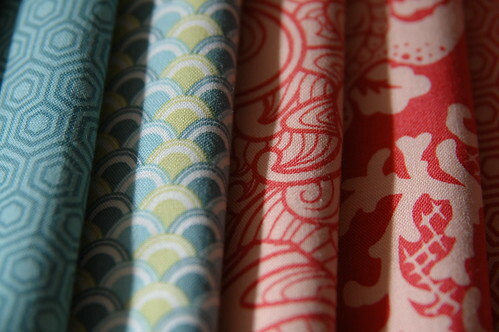 The background will be a soft grey Anna Griffin fabric. I’m really excited, it’s been a while since I’ve done one of Johanna’s quilting classes. Her clever tips and tricks are always so invaluable. 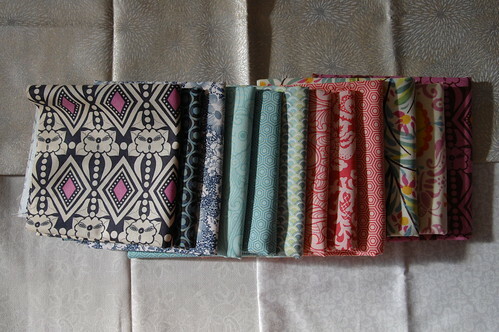 If I can stay on track then it’s possible I’ll have a completed quilt in four weeks! These are gorgeous, Karyn! You are going to have so much fun making this quilt! I can’t wait to get you all started!! Yay! I so wanted to take this class. . . I hope that it will be offered again at a later date on the weekend (hint hint) . . . Anyhow the colour palette is lovely. I look forward to seeing your progress on this quilt.